A new departure for the wonderful all-male vocal ensemble Cinquecento. They turn to the secular music—generally much less well-known—of the Renaissance masters Philippe de Monte, Jacobus Vaet and Jacob Regnart whose sacred music they have explored so successfully in previous recordings for Hyperion. Also included are six chansons by Jean Guyot de Châtelet (his name is sometimes Latinized to ‘Castileti’). This collection is both historically fascinating and stunningly performed. The music is beautiful and sensuous, with the polyphonic arts familiar from sacred works of this period now put to the service of earthly emotions. An expressively melancholic vein pervades many of these works, and one can see them as a precursor to Monteverdi’s madrigals. Philippe de Monte, Jean Guyot and Jacobus Vaet all belong to that generation of composers born around 1520, within a few years of Josquin’s death. Each illustrates in his own way how a successful career in the European musical world of the Renaissance could be achieved, and between them they established a path for future generations to follow, as did Jacob Regnart, born a couple of decades later. All four started their careers similarly, Monte in Mechelen, Vaet in Kortrijk, Guyot in the Principality of Liège, and Regnart in Douai—all benefited from a strong choir-based musical education that nurtured their talent. The four cantors could then have decided to remain in their homeland, where it would not have been difficult for them to have enjoyed the kind of professional success seen by Pierre de La Rue a generation before, and by their closer contemporaries Clemens non Papa and Thomas Crecquillon. But the four composers had a choice: they could stay at home, travel and return, or leave their country to travel across Europe. Without any guarantee of getting a steady job, this latter option was risky. In the end, being endowed with the double talent of singing and composing created a good many opportunities for each to flourish, albeit within the limitations set by patrons and the Church—or even early death. Fate, personal decisions, chance encounters and political contingencies would, as it turned out, spin a web allowing our composers to share a degree of contact without, it would appear, necessarily meeting. The death of Pieter Maessens (c1505–1562) opened the way for his compatriot Jean Guyot de Châtelet (c1512–1588) to apply in 1563 for the prestigious post of Kapellmeister to the court of Ferdinand I. Previously enjoying the enviable position of succentor at St Lambert’s Cathedral and already known for some of his motets and the thirteen songs published in Antwerp by Tylman Susato (with his name Latinized as ‘Castileti’), Guyot’s evident desire for a successful career in Vienna was to be disappointed; less than a year after his arrival he was paid-off from imperial service for the sum of fifty Florins. This coincided with the accession of Maximilian II, and the new Emperor placed his favourite musician, Jacobus Vaet, at the head of his chapel. Guyot returned to Liège where he spent the rest of his life teaching, supported by a benefice he had been able to retain. Jacobus Vaet (c1529–1567) had been a chorister in his native Kortrijk in the mid-1540s and had first joined Maximilian II’s chapel in 1554. His name is mentioned amongst Charles V’s singers, but it is not known beyond this what he did between the end of his studies at Leuven University—Guyot had attended the same faculty—and his obtaining so sought-after a job in the circle of this illustrious prince. Ten years later the same patronage led to his being appointed ‘Obristen Kapellmeister der römisch-kaiserlichen Majestät’, the position previously held by Guyot under Ferdinand I. Maximilian clearly held his composer in deep affection, but Vaet’s successful career was to be suddenly cut off by his death in 1567. Maximilian allowed the post held by Vaet to remain vacant for several years. But the emperor was also ambitious for his chapel: to raise its prestige, and presumably to guide it to new musical highs, Maximilian looked towards Italy, unsuccessfully approaching Palestrina himself. In the end, Maximilian was compelled by politics to modify his ambitions: the court already abounded in Italian musicians. The appointing of a Flemish Kapellmeister would afford him political consensus and support such as could never have been achieved by recruiting an Italian, however exceptional the latter might have been. It had been clear since the recruitment of Vaet in 1554 that Maximilian was being well advised when it came to choosing his musicians. The chosen successor to Vaet was Flemish, had travelled extensively, and had mastered a variety of composing styles—from songs to madrigals, in the Flemish, Italian, French and German styles: Philippe de Monte (1521–1603) was to hold the position in Vienna for some thirty years. Already by the time of his arrival, Monte had built up a sound reputation and, unlike Guyot or Vaet, he was widely travelled, particularly in Italy, and had an impressive number of publications to his name. Under his direction the imperial court became the musical beacon of Europe in the last third of the sixteenth century, matching easily the chapels set up by Philipp II in Spain or by the dukes of Bavaria. Jacob Regnart (c1540–1599) features prominently among the singers who contributed to the musical reputations of Vienna and Prague. He arrived at the imperial court perhaps as early as 1557 and may therefore have been witness to the succession of his countrymen at the helm of the chapel. It was a post he never held himself, having to be content with subordinate (though essential) positions. Perhaps this is what prompted him to accept occasional employment elsewhere, but he never forgot his first job and ended his career in Prague, working under Monte. While these musicians’ careers have a common thread running through the imperial chapel, their compositions are clearly distinct in both style and genre. Jean Guyot devoted himself to writing motets and songs. The musical style of his songs is not so very different from that of his motets (some of which require many musicians and so were presumably composed for the imperial chapel), but they do demonstrate strong syllabic declamation, often enlivened by the vivid prosody. This is particularly evident in the ‘rustic’ songs like Je suis amoureux d’une fille. The overall rhythm slows down in the more melancholic songs, such as En lieux d’esbatz m’assault melancolie, but nothing interrupts the ruthlessly imitative counterpoint—which makes the text more or less unintelligible. This is a shame (although the modern listener benefits from the printed text), for the music abounds in highly ingenious and sometimes quite daring parallels between the text and its musical expression. A remarkable example occurs in the last verse, ‘Helas donnez vous à son cueur’, of Vous estes si doulce et benigne. As one might expect, the word ‘Helas’ brings about a distinctive harshness, but uses a ‘prohibited’ chord; to avoid this, an option is to flatten the bass note, something which causes a rather surprising, though not unattested in earlier examples, destabilization of the harmonic process, and this is what the singers here have chosen to employ. Similarly, other pieces show a liking for figuralism borrowed from Italian madrigalists. In L’arbre d’amour ung fruict d’amaritude, a strikingly original piece if only for being notated for four high voices, various harmonic false relations emphasize bitterness. The last two Guyot songs (Vous perdez temps and Tel en mesdict) comprise a Chanson–Response pairing, the first line of the one being the same as the last of the other. The Chanson takes its text from Clément Marot, and while the Response is by an anonymous author, the two parts are bonded into a homogeneous structure by common animated rhythms and are clearly inspired by the satirical mind of the ‘prince of French poets’. Just three songs by Jacobus Vaet appear in print, and these in anthologies by different publishers: Sans vous ne puis (Phalèse, 1554), Amour leal (Waelrent, 1556) and En l’ombre d’ung buissonet (Neuber, 1568), making them slightly later than Guyot’s songs. All employ a standard group of four voices. It would appear Vaet was more responsive to the Mass and motet genres and his three songs, eschewing the rhetorical subtleties of Guyot, demonstrate how closely motet- and song-writing in the mid-sixteenth century were related. Both before and after Philippe de Monte’s appointment to the Viennese court, the principal publishing houses of Europe issued a steady flow of his motets, Masses, madrigals and songs, and in the genre of the five-voice madrigal he was a pioneer. Musicology has often unjustly criticized Monte for lacking originality. A song like Sortez regretz may indeed adopt forms that had been used by Gombert a generation earlier, but the result is nonetheless imbued with a uniquely sorrowful beauty. With the five-part Susanne un jour, however, Monte breaks away from his predecessors in being the first of just three composers of his day (the other two are Millot and Du Caurroy) to disregard completely the cantus-firmus structure in order to adopt a madrigalian form, freely composed, and only using short motivic restatements. Osmosis within the secular genres did not confine itself to French chansons. Borrowings from the madrigal or from motets can also be found in German-texted songs such as Venus du und dein Kind, a lovely villanelle for three voices by Jacob Regnart, whose compositions are a high-point of the late sixteenth century. Unlike the French song of the second half of the sixteenth century, the earlier development by Flemish masters of the chanson is encapsulated in the works of these four composers. Working towards a stylistic synergy within diversity of textual expression, these composers drew both on their illustrious compatriots—Gombert as well as Crecquillon and Clemens non Papa—and on their own experiments. Vaet took inspiration from the motet; Monte from the madrigal; Regnart turned towards lighter Italian forms; and Guyot embedded himself unashamedly in the traditions of the Low Countries. But all found ways of writing which shared, in whatever language, the deep links unifying text and music in the twilight of the Renaissance. Philippe de Monte, Jean Guyot de Châtelet et Jacobus Vaet appartiennent à la même génération, celle des compositeurs nés dans les années 1520 au moment même où Josquin meurt. Ils illustrent, chacun à leur façon, une manière de mener une belle carrière dans l’Europe musicale de la Renaissance, posant en quelque sorte les jalons que plusieurs générations ne pourront s’empêcher de parcourir comme l’illustre idéalement Jacob Regnart. Il serait aisé de résumer ces carrières en quelques lignes, car elles semblent toutes articulées autour des mêmes moments forts. Celui de la formation, d’abord. Monte à Malines, Vaet à Courtrai, Guyot dans la principauté de Liège ou Regnart à Douai reçoivent une solide éducation musicale dans une maîtrise qui permet de révéler les talents. Les quatre chantres eussent pu choisir de demeurer en leurs terres d’origine. On pouvait tout compte fait y mener une belle carrière. Pierre de La Rue, né une génération auparavant, le leur démontrait. Clemens non Papa et Thomas Crecquillon ne s’en sont pas privés. Les quatre compositeurs avaient donc le choix: soit rester, soit partir et revenir, soit s’expatrier définitivement, soit se risquer sur les chemins de d’Europe sans garantie d’obtention d’un poste stable. Finalement, être doté du double talent—de chanteur et de compositeur—offrait de belles possibilités, qui s’épanouissaient cependant dans les limites imposées par les mécènes et l’Église, dans les limites également de vies parfois brèves. Les destins de vie, les stratégies personnelles, le hasard des rencontres, les contingences politiques tissent cependant les fils d’une toile qui permettent à plusieurs compositeurs d’entretenir des relations sans s’être probablement croisés. Tout commence avec Jean Guyot (c1512–1588). À la mort de son maître de chapelle Pieter Maessens (c1505–1562), la cour impériale de Ferdinand Ier vit apparaître en 1563 un autre Flamand, Jean Guyot de Châtelet, qui avait apparemment sollicité un tel emploi dans ce milieu prestigieux, bien que bénéficiant à Liège de la place non négligeable de succentor (maître de chant) à la cathédrale Saint-Lambert. Déjà connu par quelques motets et treize chansons publiées chez l’éditeur anversois Tylman Susato (où il avait fait latiniser son nom en «Castileti»), son espoir de faire carrière à Vienne devait être déçu, car moins d’un an après son arrivée, il se vit remercié par l’empereur avec une somme de cinquante florins pour services rendus, ce départ coïncidant avec l’accession au trône impérial de Maximilien II qui amenait à la tête de la chapelle son musicien favori Jacobus Vaet. Guyot devait retourner à Liège où il termina son existence comme pédagogue et grâce à un bénéfice qui lui avait été conservé. Jacobus Vaet (c1529–1567), lui, était né à Courtrai et y fut enfant de chœur au milieu des années 1540. En 1554, il intègre la chapelle de Maximilien II. On ignore—à l’exception d’une mention parmi les chanteurs de Charles-Quint—ce qu’il fit entre ses études à l’université de Leuven, faculté qu’avait également fréquenté Guyot, et l’obtention de ce poste privilégié auprès d’un prince en vue. Dix ans plus tard, protégé par son illustre mécène, il devient «Obristen Kapellmeister der römisch-kaiserlichen Majestät», poste précédemment occupé par Guyot auprès de Ferdinand Ier. Maximilien manifeste un réel attachement à son compositeur, et la mort de Vaet en 1567 interrompt brutalement cette belle carrière. Maximilien reste désemparé, visiblement, par cette disparition. Durant plusieurs années, le poste qu’occupait Vaet reste vacant. Il faut dire que Maximilien avait des ambitions pour sa chapelle. Pour lui donner plus de lustre encore, pour l’orienter vers d’autres horizons musicaux sans doute aussi, il cherche du côté de l’Italie. Palestrina en personne sera sollicité, qui refusera. D’autres se pressent pour décrocher ce poste très en vue. Maximilien doit néanmoins revoir ses ambitions, non pas en termes de qualité, mais en termes de politique. De musiciens italiens, la cour regorge déjà suffisamment et, symboliquement, confier la tâche à un Flamand lui permettrait d’obtenir un consensus et même un soutien qu’il n’aurait espéré obtenir en recrutant un compositeur italien, tout exceptionnel qu’il eut pu être. Maximilien choisit bien ses musiciens. Il l’avait prouvé dès 1554 lorsqu’il avait recruté Vaet. Il le démontre une fois encore en se tournant vers un Flamand qui avait déjà parcouru pas mal de chemins et acquis une belle maîtrise des diverses manières de composer, que ce soit celle de la chanson ou du madrigal, celle des Flamands ou des Italiens, des Français ou des Allemands. Philippe de Monte (1521–1603) arrive donc à Vienne où il occupera pendant une trentaine d’années le poste de son compatriote Vaet. Lorsqu’il arrive, Monte s’était déjà construit une solide réputation. Contrairement à Guyot et à Vaet, il avait beaucoup voyagé, notamment en Italie, et avait à son actif une quantité impressionnante de publications. Sa productivité ne ralentit nullement. Il fera même de la musique de l’Empereur l’ensemble phare de l’Europe du dernier tiers du XVIe siècle, rivalisant aisément avec les chapelles réunies par Philippe II en Espagne ou les ducs de Bavière. Parmi les chantres que contribuent à l’excellente réputation musicale de Vienne et de Prague figure en bonne place Jacob Regnart (c1540–1599). Il était arrivé à la cour impériale dès 1557: il a donc pu contempler la succession de ses «compatriotes» à la tête de la chapelle, poste qu’il n’a jamais obtenu, se contentant de positions subalternes (et néanmoins essentielles) qui l’incitèrent à accepter des offres venues d’ailleurs, non sans jamais oublier son premier poste: il termine sa carrière à Prague, où il travaille sous la direction de Monte. Si les carrières de ces musiciens ont un point commun—la chapelle impériale—, leurs compositions et la diffusion de celles-ci se distinguent nettement. Ainsi, Guyot semble ne s’être adonné qu’à l’écriture de motets et de chansons. Le style musical de ses chansons ne se différencie guère de celui de ses motets—dont certains, à grand effectif, furent sans doute composés pour la chapelle impériale—, sinon par une déclamation syllabique constante, souvent animée par une prosodie vivace, en particulier dans les chansons de type «rustique» comme Je suis amoureux d’une fille, tandis que le rythme général se ralentit pour la plus mélancolique, précisément En lieux d’esbatz m’assault melancolie. Mais rien ne vient jamais interrompre le déroulement d’un contrepoint impitoyablement imitatif, ce qui rend à peu près inopérante l’intelligibilité du texte. C’est fort dommage (bien que nous, auditeurs modernes, ayons à notre disposition l’avantage d’un texte imprimé), car cette musique abonde en rapports extrêmement ingénieux et parfois particulièrement hardis entre le texte et son expression musicale. Le cas le plus remarquable se situe vers la fin de Vous estes si doulce et benigne, à l’énoncé du dernier vers «Helas donnez vous à son cueur». Comme on peut s’y attendre, le mot «Helas» entraine une dureté particulière par émission d’un accord prohibé, mais si on veut l’éviter il est possible de procéder à la bémolisation de la note de basse, ce qui entraîne jusqu’à la fin un processus harmonique surprenant et quelque peu déstabilisant, quoique attesté par quelques exemples antérieurs; c’est ce procédé, laissé à la liberté des chanteurs, qui a été choisi ici. D’autres pièces témoignent également de ce penchant pour un figuralisme emprunté aux madrigalistes italiens, comme L’arbre d’amour ung fruict d’amaritude où diverses fausses relations harmoniques viennent connoter la notion d’amertume, mais dont la plus singulière originalité est d’être composé pour quatre voix de registre élevé. Les deux dernières chansons (Vous perdez temps et Tel en mesdict) forment un couple Chanson–Response, dans lequel le premier et le dernier vers de chacune forment entre elles un chiasme, c’est-à-dire un croisement en X. La Chanson proprement dite a pour source littéraire une des «Chansons» de Clément Marot, tandis que l’auteur de la Response est anonyme, mais les deux parties de cet ensemble, très homogènes dans la structure et la rythmique animée, sont manifestement inspirées par l’esprit satirique du «prince des poètes français». Vaet n’aurait composé que trois chansons, imprimées par des éditeurs différents dans des anthologies (respectivement Phalèse, Waelrent et Neuber): Sans vous ne puis (1554), Amour leal (1556), En l’ombre d’ung buissonet (1568). Elles sont donc légèrement postérieures à celles de Guyot et se contentent de l’effectif standard, à quatre voix. Le genre n’a guère inspiré Vaet, visiblement plus sensible aux messes et aux motets. Vaet ne se livre pas aux subtils jeux rhétoriques de Guyot, tout en produisant trois pièces qui témoignent de la proximité en ce milieu du XVIe siècle entre écriture pour motet et écriture pour la chanson. Monte a laissé une œuvre stupéfiante en quantité. Que ce soit avant ou après son arrivée à la cour de Vienne, le compositeur ne cesse d’inonder les principales places de l’édition musicale de motets, messes, madrigaux et chansons. Le Flamand a imposé un standard dans le madrigal à cinq voix: il y fait figure de pionnier. La musicologie a souvent reproché, à tort, à Monte de manquer d’originalité. Il est vrai qu’une chanson comme Sortez regretz emprunte des tournures que Gombert exploitait volontiers. Qu’importe, car le résultat est une belle chanson triste. Avec Susanne un jour à 5, Monte se distingue de ses prédécesseurs en ce qu’il est le premier des trois compositeurs (pas davantage: les deux autres sont Millot et Du Caurroy) à négliger complètement la structure de cantus firmus pour adopter une forme madrigalesque, librement composée, utilisant seulement de brefs rappels motiviques. L’osmose qui se produit entre les genres profanes et dont l’œuvre de Philippe de Monte témoigne avec force et quantité, ne se limite pas seulement aux emprunts de la chanson française aux figures du madrigal (Monte), ni même aux motets (Vaet). Cette osmose s’étend aussi à la chanson sur textes allemands. Regnart, dont la production a marqué la fin du XVIe siècle, illustre ce type de relation avec Venus du und dein Kind, une charmante villanelle à trois voix, et du reste la seule pièce de lui à peu près connue. Avec l’œuvre de ces quatre compositeurs, c’est en quelque sorte la trajectoire de la chanson française par des maîtres «flamands» qui est illustrée. Contrairement à la chanson française de la seconde moitié du XVIe siècle, celle des Flamands s’oriente résolument vers un syncrétisme stylistique. Pour se mettre au service de la diversité des expressions textuelles, les compositeurs puisent autant dans les expériences menées par leurs prédécesseurs illustres en terres flamandes—Gombert, mais aussi Crecquillon ou Clemens non Papa—que dans leurs propres expérimentations. Vaet s’inspire du motet; Monte puise au madrigal; Regnart se tourne vers les formes italiennes légères; Guyot s’inscrit résolument dans la tradition des Pays-Bas. Diverses manières d’écrire pour partager sur quelque langue que ce soit les liens profonds qui unissent texte et musique au crépuscule de la Renaissance. Philippe de Monte, Jean Guyot und Jacobus Vaet gehören alle jener Generation von Komponisten an, die um 1520, kurz nach Josquins Tod, geboren wurden. Jeder von ihnen illustriert auf seine Weise, wie eine erfolgreiche Karriere in der europäischen Musikwelt der Renaissance erreicht werden konnte und zusammen ebneten sie den Weg, den auch die Komponisten folgender Generationen einschlagen konnten, wie etwa Jacob Regnart, der zwei Jahrzehnte später geboren wurde. Alle vier begannen ihre Karriere in ähnlicher Weise; Monte in Mechelen, Vaet in Kortrijk, Guyot im Fürstentum Lüttich und Regnart in Douai; und alle vier entstammten einer bedeutenden Chortradition, in der sich ihre Talente entfalten konnten. Danach hätten die vier Sänger in ihrer Heimat bleiben können, wo sie ohne Weiteres den beruflichen Erfolg hätten erlangen können, der Pierre de La Rue in der Generation vor ihnen, sowie näheren Zeitgenossen wie Clemens non Papa und Thomas Crecquillon zuteil wurde. Die vier Komponisten hatten jedoch die Wahl—sie konnten zuhause bleiben, sie konnten reisen und dann wieder zurückkehren oder aber ihr Land definitiv verlassen, um durch Europa zu reisen, ohne dabei die Garantie auf eine feste Anstellung zu haben. Letztendlich standen ihnen dank ihrer Doppeltalente als Sänger und Komponisten diverse Möglichkeiten offen, die von Einschränkungen durch Mäzene, die Kirche oder eine kurze Lebensdauer begrenzt waren. Schicksal, persönliche Entscheidungen, zufällige Begegnungen und politische Gegebenheiten sollten ein Netz spinnen, durch das unsere Komponisten einen gewissen Kontakt pflegen konnten, offensichtlich jedoch ohne sich gegenseitig kennenzulernen. Nach dem Tod von Pieter Maessens (ca.1505–1562) konnte sein Landsmann Jean Guyot de Châtelet (ca.1512–1588) sich im Jahre 1563 um den prestigeträchtigen Posten des Kapellmeisters am Hof von Ferdinand I. bewerben. Zuvor war er als Succentor an der Kathedrale zu Saint-Lambert tätig gewesen und bereits für einige seiner Motetten und die dreizehn Lieder, die in Antwerpen von Tylman Susato herausgegeben worden waren (wobei sein Name in latinisierter Form als „Castileti“ erschien), berühmt. Doch sollten Guyots offensichtliche Bemühungen um eine erfolgreiche Karriere in Wien fehlschlagen: weniger als ein Jahr nach seiner Ankunft wurde er von dem Kaiser für seinen Dienst mit der Summe von 50 Dukaten ausbezahlt. Dies fiel mit der Thronbesteigung Maximilians II. zusammen, der seinem Lieblingsmusiker Jacobus Vaet die Leitung seiner Kapelle übertrug. Guyot kehrte nach Lüttich zurück, wo er bis zu seinem Tod blieb, sich der Lehre widmete und von einer Pfründe lebte, die er hatte beibehalten können. Jacobus Vaet (ca.1529–1567) war in seiner Heimatstadt Kortrijk in der Mitte der 1540er Jahre Chorknabe gewesen und war 1554 der Kapelle Maximilians II. beigetreten. Er ist auch als einer der Sänger von Karl V. verzeichnet, doch ist nicht bekannt, was er zwischen seinem Studienabschluss an der Universität zu Löwen und dem Antritt einer so begehrten Stelle im Zirkel dieses illustren Prinzen tat. Zehn Jahre später wurde er dank desselben Gönners zum „Obristen Kapellmeister der römisch-kaiserlichen Majestät“ ernannt, jene Stelle, die vor ihm Guyot unter Ferdinand I. innegehabt hatte. Maximilian schätzte seinen Komponisten offenbar sehr, doch sollte Vaets erfolgreiche Karriere durch seinen Tod im Jahre 1567 ein jähes Ende nehmen. Maximilian ließ dann die verwaiste Stelle mehrere Jahre lang unbesetzt. Doch hatte der Kaiser auch gewisse Ambitionen für seine Kapelle: Um ihr Ansehen zu steigern und wohl um eine neue musikalische Blütezeit einzuleiten, wandte Maximilian sich nach Italien und bot, jedoch erfolglos, Palestrina selbst den Posten an. Letztendlich musste Maximilian aus politischen Gründen seine Pläne etwas modifizieren, da am Hof bereits zahlreiche italienische Musiker tätig waren. Den Posten einem Flamen zu übertragen war insofern ein kluger politischer Schachzug, als dass ihm dies größere Übereinstimmung und Unterstützung einbringen würde, als er mit einem Italiener erreichen konnte, so herausragend dieser auch sein mochte. Maximilian wählte seine Musiker sorgfältig aus. Das hatte sich bereits 1554 gezeigt, als er Vaet an seinen Hof geholt hatte. Der auserwählte Nachfolger Vaets war ein weitgereister Flame, der verschiedene Kompositionsstile—von Liedern zu Madrigalen im flämischen, italienischen, französischen und deutschen Stil—gemeistert hatte: Philippe de Monte (1521–1603) sollte über dreißig Jahre lang in Wien als Hofkapellmeister wirken. Schon vor seiner Ankunft in Wien hatte Monte sich einen soliden Ruf erarbeitet und, anders als Guyot oder Vaet, war er viel umhergereist, insbesondere in Italien, und hatte eine beeindruckende Anzahl von Publikationen herausgebracht. In Wien ließ seine Produktivität keineswegs nach: unter seiner Leitung wurde der kaiserliche Hof im letzten Drittel des 16. Jahrhunderts der musikalische Leitstern Europas und konnte es ohne Weiteres mit den Kapellen Philipps II. in Spanien oder derjenigen der bayrischen Fürsten aufnehmen. Jacob Regnart (ca.1540–1599) gehört zu jenen Sängern, die entscheidend zu dem musikalischen Ruf Wiens und Prags beitrugen. Er kam möglicherweise bereits 1557 am kaiserlichen Hof an und mag daher seine beiden Landsmänner in der Führungsposition der Kapelle erlebt haben. Er selbst hatte diesen Posten nie inne und musste sich mit untergeordneten (jedoch notwendigen) Positionen begnügen. Möglicherweise nahm er deshalb hin und wieder anderswo Gelegenheitsstellen an, doch vergaß er nie seine erste Stelle und beendete seine Karriere in Prag, wo er unter Monte wirkte. Weisen auch die Laufbahnen dieser Musiker das gemeinsame Element der kaiserlichen Kapelle auf, so unterscheiden sich doch ihre Werke in Stil und Genre erheblich voneinander. Jean Guyot widmete sich der Komposition von Motetten und Liedern. Der musikalische Stil seiner Lieder unterscheidet sich nicht so sehr von dem seiner Motetten (die zum Teil für große Besetzungen, also wahrscheinlich die kaiserliche Kapelle, angelegt sind), doch demonstrieren sie starke syllabische Deklamation, die oft durch die lebhafte Prosodie aufgelockert wird. Dies wird in den „rustikalen“ Liedern, wie etwa Je suis amoureux d’une fille, besonders deutlich. In den eher melancholischen Liedern, wie zum Beispiel En lieux d’esbatz m’assault melancolie, ist der vorherrschende Rhythmus langsamer gehalten, doch lässt sich der erbarmungslose Kontrapunkt von nichts unterbrechen, was den Text mehr oder minder unverständlich macht. Das ist bedauerlich (obwohl der moderne Zuhörer den gedruckten Text mitverfolgen kann), da die Musik voller genialer und zuweilen recht kühner Parallelen zwischen Text und dessen musikalischer Umsetzung ist. Ein bemerkenswertes Beispiel hierfür vollzieht sich in der letzten Zeile, „Helas donnez vous à son cueur“, von Vous estes si doulce et benigne. Wie zu erwarten ist, bringt das Wort „Helas“ eine charakteristische Härte mit sich, verwendet jedoch einen „verbotenen“ Akkord; um dies zu vermeiden, kann etwa der Basston erniedrigt werden, was—wie man in früheren Werken beobachten kann—einen überraschenden und etwas destabilisierten harmonischen Verlauf mit sich bringt: hierfür haben sich die Sänger in diesem Fall entschieden. In ähnlicher Weise zeigen andere Stücke eine gewisse Vorliebe für Figuralismus auf, wie er in italienischen Madrigalen auftritt. In L’arbre d’amour ung fruict d’amaritude, ein Stück, dessen originellste Eigenschaft die Anlage für vier hohe Stimmen ist, betonen verschiedene harmonische Querstände die Bitterkeit. Die letzten beiden Lieder von Guyot (Vous perdez temps und Tel en mesdict) bilden eine Chanson-Response-Kombination, wobei jeweils die erste Zeile des einen Liedes der letzten Zeile des anderen entspricht. Der Text der Chanson stammt von Clément Marot, und obwohl der Autor der Response anonym ist, verbinden sich beide Teile durch gemeinsame lebhafte Rhythmen zu einer homogenen Struktur, und sind offensichtlich von dem satirischen Gemüt des „französischen Dichterfürsten“ inspiriert. Von Jacobus Vaet sind nur drei Lieder im Druck erschienen, und diese finden sich in Anthologien verschiedener Herausgeber: Sans vous ne puis (Phalèse, 1554), Amour leal (Waelrent, 1556) und En l’ombre d’ung buissonet (Neuber, 1568). Sie sind also etwas jünger als die Lieder Guyots und alle sind für eine Standardbesetzung von vier Stimmen angelegt. Vaet war offenbar deutlich empfänglicher für Messen und Motetten; seine drei Lieder, die auf die rhetorischen Feinheiten Guyots verzichten, zeigen, wie eng die Motetten- und Liedkomposition um die Mitte des 16. Jahrhunderts miteinander verbunden waren. Sowohl vor als auch nach Philippe de Montes Amtszeit am Wiener Hof gaben die großen europäischen Verlagshäuser einen stetigen Strom seiner Motetten, Messen, Madrigale und Lieder heraus; im Genre des fünfstimmigen Madrigals war er ein Pionier. Die Forschung hat Monte oft zu Unrecht für fehlende Originalität kritisiert. Zwar mag ein Lied wie Sortez regretz durchaus die Formen verwenden, die Gombert bereits eine Generation früher eingesetzt hatte, doch ist das Resultat trotzdem durchtränkt von einer einzigartigen traurigen Schönheit. Mit dem fünfstimmigen Susanne un jour hingegen wendet Monte sich von seinen Vorgängern ab, indem er als erster von nur drei Komponisten seiner Zeit (die anderen beiden sind Millot und Du Caurroy) die Cantus-firmus-Struktur völlig beiseite lässt und sich stattdessen einer madrigalischen Form zuwendet, die frei komponiert ist und in der nur kurze motivische Figuren zum Ausdruck kommen. Eine Osmose innerhalb weltlicher Musikgenres beschränkte sich nicht allein auf französische Chansons. So finden sich beispielsweise auch Entlehnungen vom Madrigal oder von Motetten in Liedern mit deutschen Texten, wie etwa Venus du und dein Kind, eine wunderschöne Villanelle für drei Stimmen von Jacob Regnart, dessen Werke ein Höhepunkt in der Musik des späten 16. Jahrhundert sind. Die Entwicklung der flämischen Meister der Chanson ist in den Werken dieser Komponisten zusammengefasst. Anders als es sich etwas später beim französischen Lied in der zweiten Hälfte des 16. Jahrhunderts verhielt, strebten unsere vier Komponisten innerhalb der Vielfalt des textlichen Ausdrucks eine stilistische Synergie an und bezogen sich sowohl auf ihre illustren Landsmänner—Gombert, Crecquillon und Clemens non Papa—als auch auf ihre eigenen Experimente. Vaet wählte die Motette als Inspirationsquelle, Monte das Madrigal, Regnart wandte sich den leichteren italienischen Formen zu und Guyot verschrieb sich resolut den Traditionen der Niederlande. 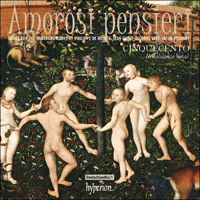 Alle jedoch fanden einen Kompositionsstil, der, in jedweder Sprache, die tiefgehenden Verbindungen zwischen Text und Musik gegen Ende der Renaissance teilte.